The Colorado potato beetle, also known as an international super pest, munches on a potato plant leaf. Although the RNAi strategy was implemented in plants years ago, it failed as a powerful insecticide because the pests didn’t all die, explains Steve Whyard, at the University of Manitoba, in Winnipeg, in an associated commentary (Science 2015, DOI: 10.1126/science.aaa7722). Bock, Zhang, and their colleagues, however, have now made a “clever modification” to the earlier, partially successful strategy, Whyard notes, by inserting the instructions to make the double-stranded insecticidal RNA into plant cells’ chloroplasts, instead of into their nuclei. 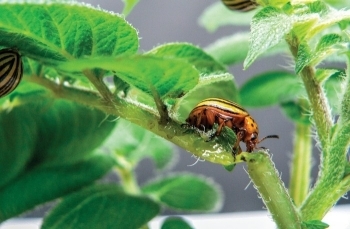 The result of putting the insecticidal RNA into chloroplasts, a plant’s photosynthesis hot spot, was full crop protection from the Colorado potato beetle.